Our Euro Explorer tour featuring Amsterdam and London has been one of the biggest hits at AESU. Members explore these European cities in 5 days and 7 nights, seeing all of the sights on our exclusive scavenger hunt. During one of the days, we stop at one of our favorite Indonesian restaurants to sample some of the country’s best dishes and many people have been curious as to why. What’s the history behind the Netherland’s thriving Indonesian cuisine scene anyway? The Netherlands and Indonesia share a special relationship that began during the spice trades as the Netherlands established VOC trading posts in current day Indonesia. The Southeast Asian country was the largest former Dutch colony and as of the 21st century, the Dutch government has committed to boosting its relationship with the country as attempts to strengthen economic, political, and interpersonal contacts. It can easily be described as one of the most vibrant, colorful cuisines in the world. Indonesian foods are full of intense flavor that stems from its diversity, meaning that Indonesia is composed of approximately 6,000 populated islands. Traditional Indonesian meals typically consist of steamed rice surrounded by vegetables, and meat or fish as side dishes. During a standard meal, family members gather around a table filled with communal dishes that are passed around throughout the entirety of the meal. 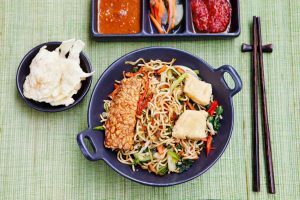 Mi goreng, pictured above, is a flavorful and spicy fried noodle dish commonly found in Indonesia and the Netherlands. It’s made with thin yellow noodles that are fried in cooking oil with garlic, onion, fried prawn, chicken, pork, beef, sliced basko, Chinese cabbage, tomatoes, eggs, and other vegetables. An introductory course in Amsterdam’s Indonesian food scene will surely lead you to this term. The Indonesian rijsttafelm, a Dutch word that literally translates to “rice table”, is an elaborate Asian meal adapted by the Dutch. It consists of several side dishes served in small portions accompanied by rice prepared in several different ways. Originally, a colonial feast to provide a festive type of banquet that represented the multi-ethnic nature of the Indonesian archipelago, the rijsttafel can be found at many Indonesian restaurants in Amsterdam. Visit Amsterdam & London with the Euro Explorer! This entry was posted on Wednesday, January 25th, 2017	at 11:54 am	. You can follow any responses to this entry through the RSS 2.0	feed. Both comments and pings are currently closed.